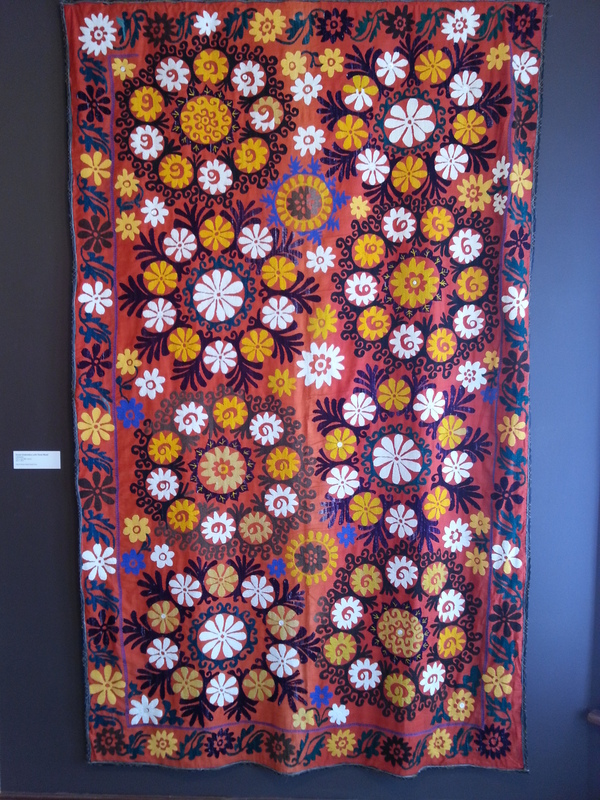 Ten days ago, I was fortunate to visit the La Conner Quilt & Textile Museum where there was a stunning exhibit of Suzani embroidery from Uzbekistan. These pieces, covered with dense embroidery, are bold and colorful. They are recent acquisitions for the museum from the Miriam Wosk Family Trust. They will be displayed for one more day, so if you are in the La Conner area, get over there to see them! 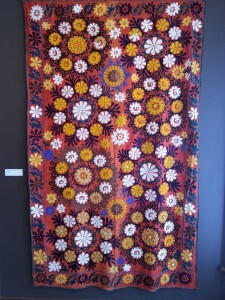 This floral example was made in the late 20th century. The word “suzani” is derived from the Persian word for needle.They are traditionally created in the western region of Central Asia, including Uzbekistan, Kazakhstan, Kryrgystan, Tajikistan, and Turkmenistan. 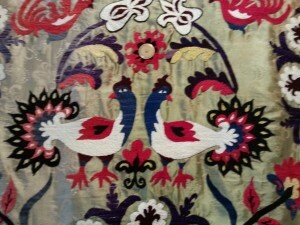 They remind me of the beautiful embroidery I saw in Western Mongolia, the Kazakh area of the country. 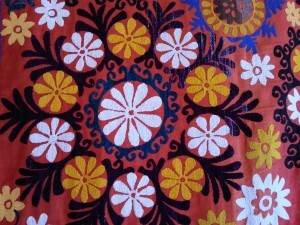 Natural motifs are often the theme. 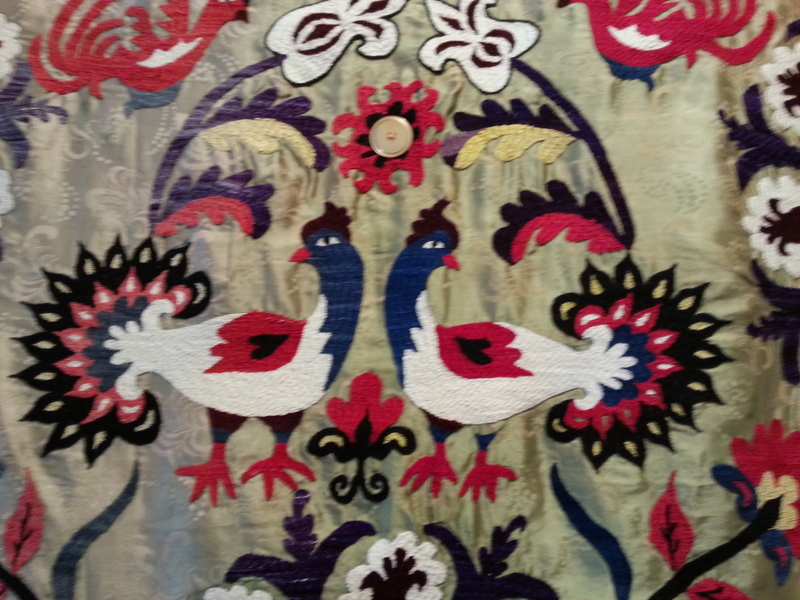 Here is my favorite one with lovely birds. 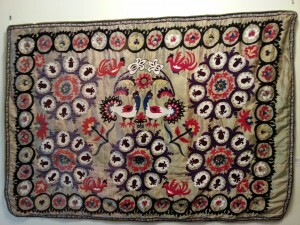 This one was made in the first half of the 20th century.The suzani is both decorative and functional. Often they are created when a daughter is born as part of her dowry. 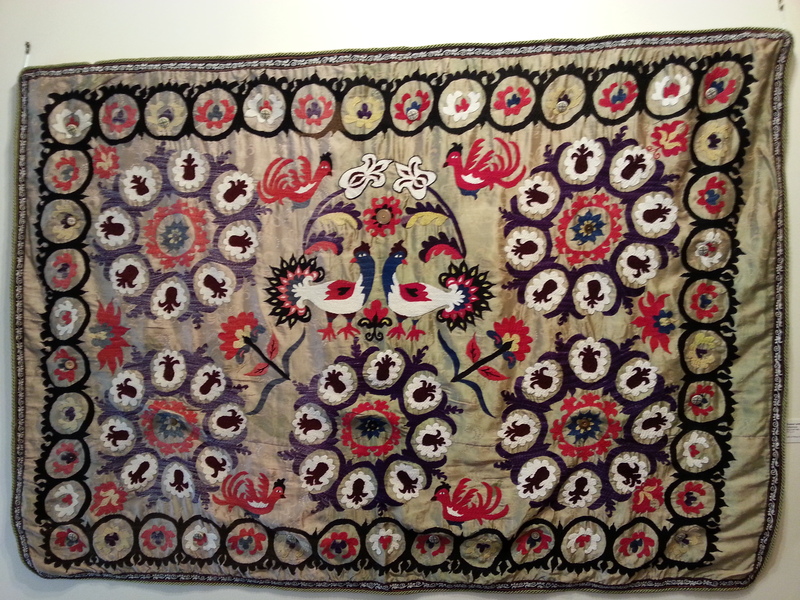 Women work together and several suzanis may be presented to a groom on the girl’s wedding day. 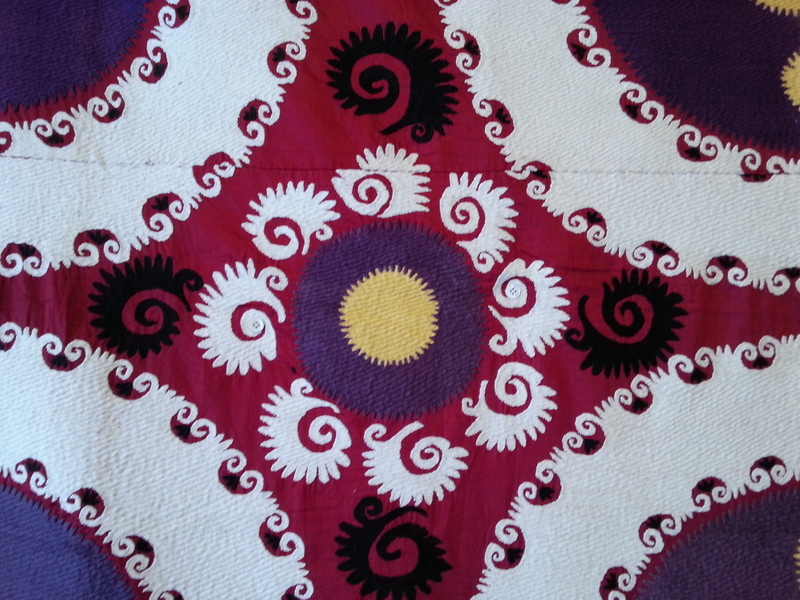 This maroon suzani bedspread was made in the late 20th Century. 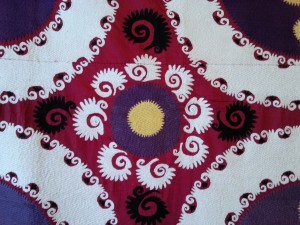 The stitching in suzanis is dense and includes chain stitch, buttonhole stitch and couching. They sometimes look as though they are woven. 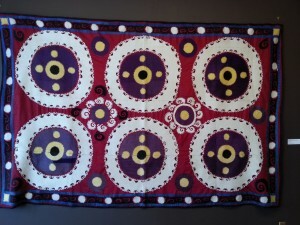 The larger ones are often created in smaller panels, two to six depending on the size and the design. 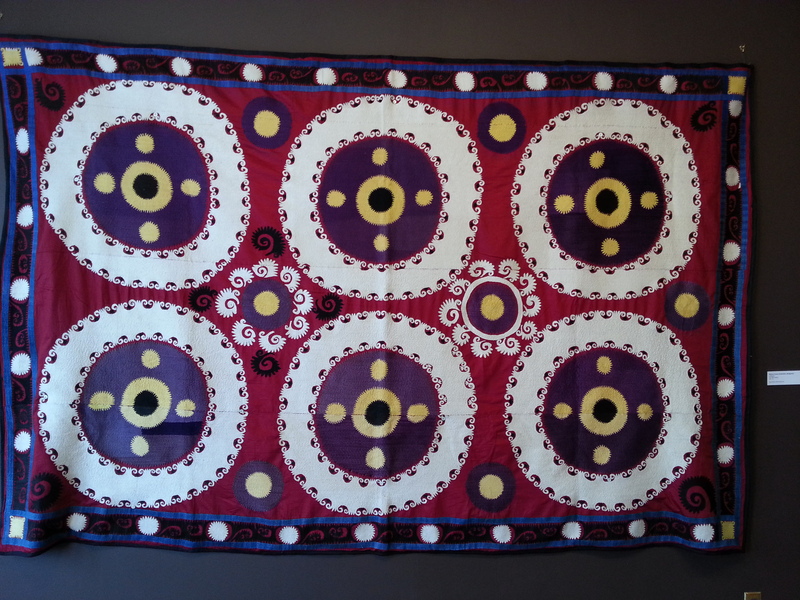 The Kazakh pieces I saw in Mongolia were all done with chain stitch and the stitching was not so dense. 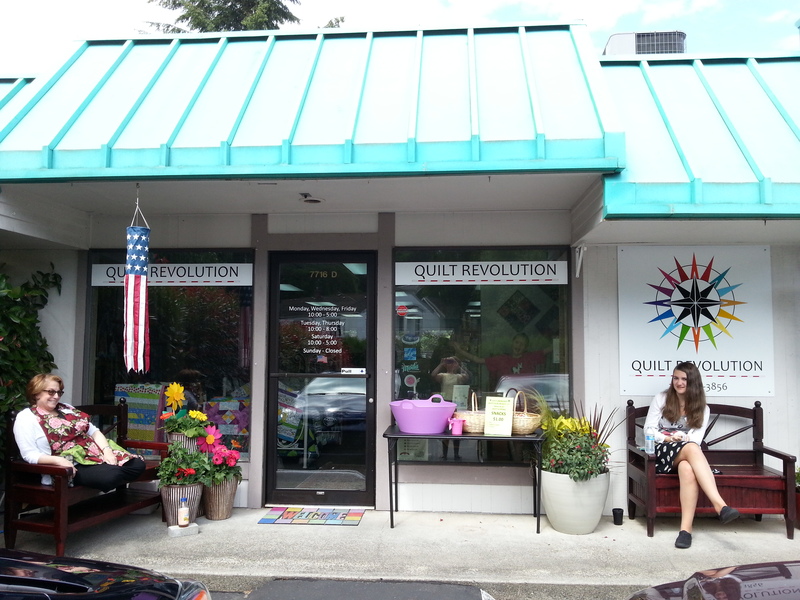 There are in the region of 55 quilt shops from the Canadian border down to the Oregon border, and each offers a different block for the Shop Hop quilt. 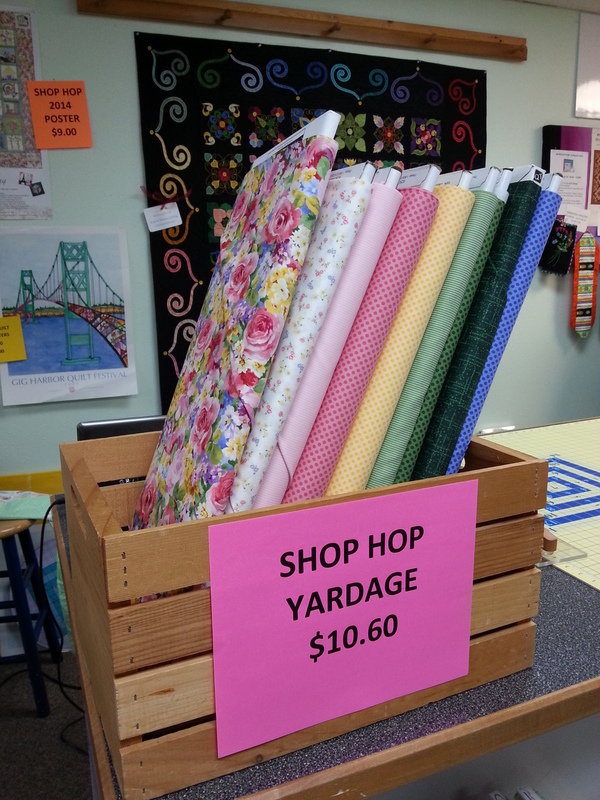 Quilters receive a small baggie with the block pattern and fabric. 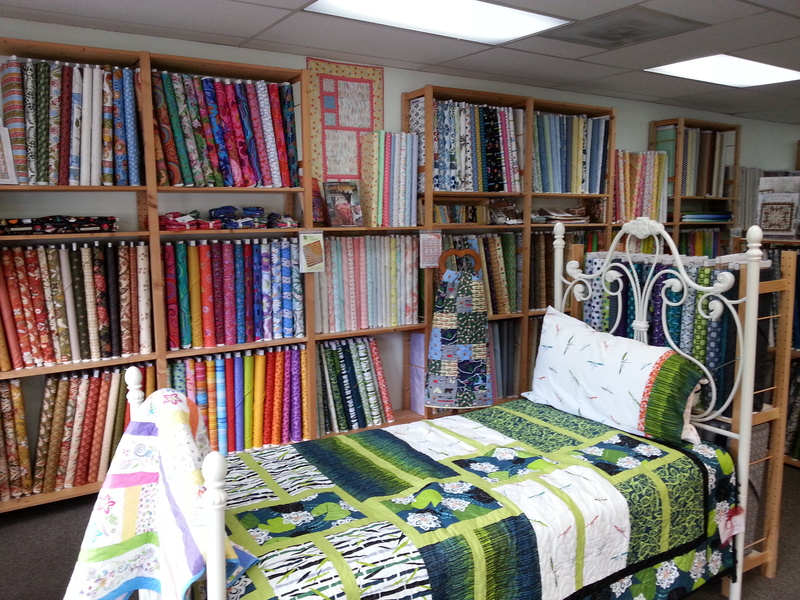 There is a theme fabric with coordinating prints which all the shops use. 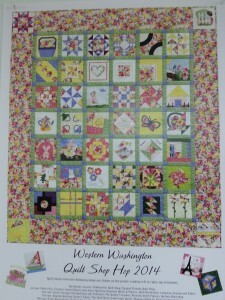 Here’s the fabric and a poster which includes all the blocks from the shops. Then of course, the quilters have the opportunity to shop and watch demonstrations. 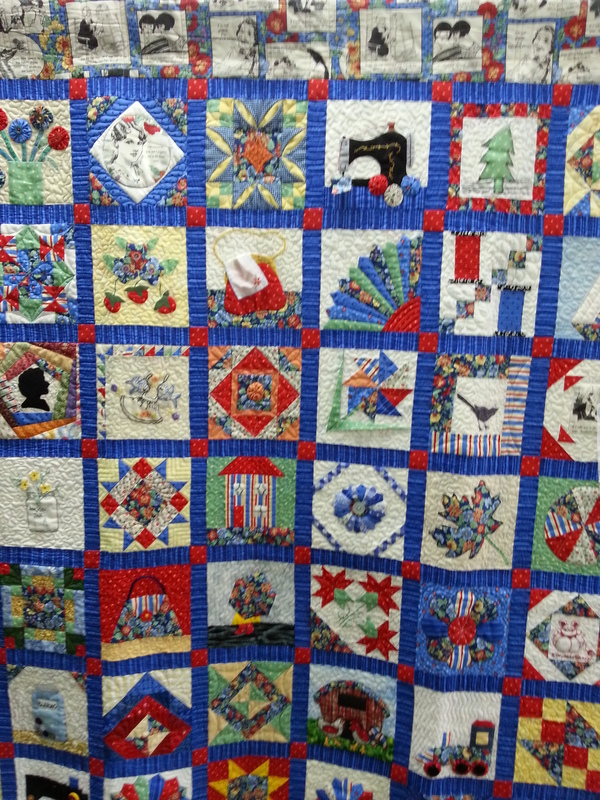 At Quilt Revolution, they had a wonderful exhibit of Shop Hop quilts from previous years and the quilters really enjoyed reminiscing with many bemoaning that they hadn’t finished their quilts! However, this doesn’t deter them from doing the Shop Hop year after year! 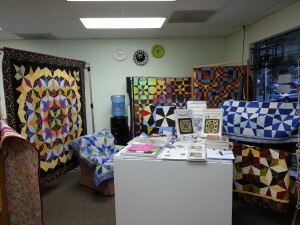 There were at least eight quilts displayed and they were all made by the same quilter, Becky Curneen. 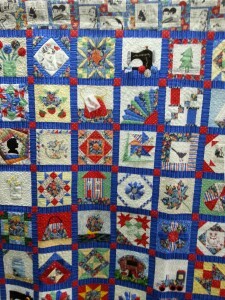 The one in the picture is from 2011 and was quilted by Rose Flannigan. 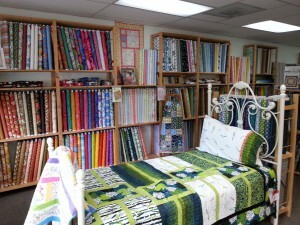 There were 55 participating shops in 2011 and Becky visited them all. She added one more block to make a total of 56. 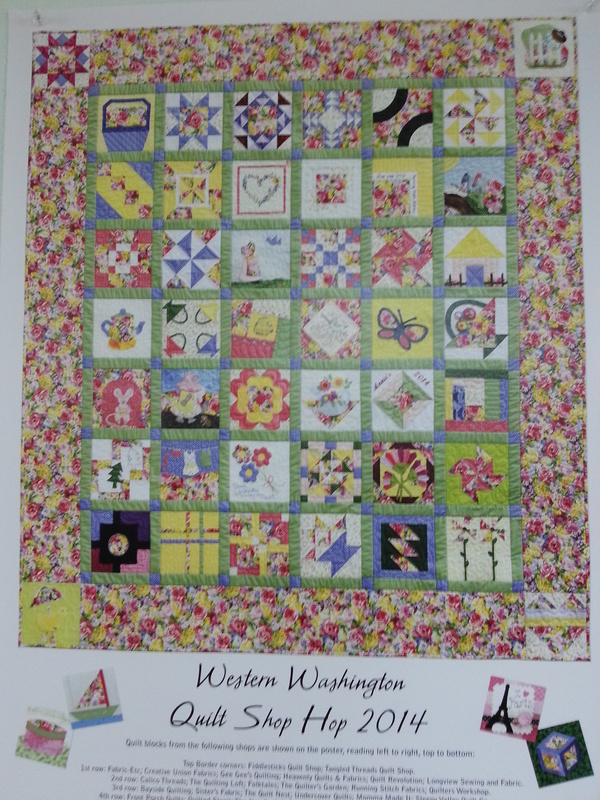 The blocks are 6-1/2″ and the quilt is large. The other photo shows my demo area before the doors opened. I stayed busy all day with scarcely a dull moment and it was fun. Once again, I have failed to keep up with weekly blogs. I do have a good reason! 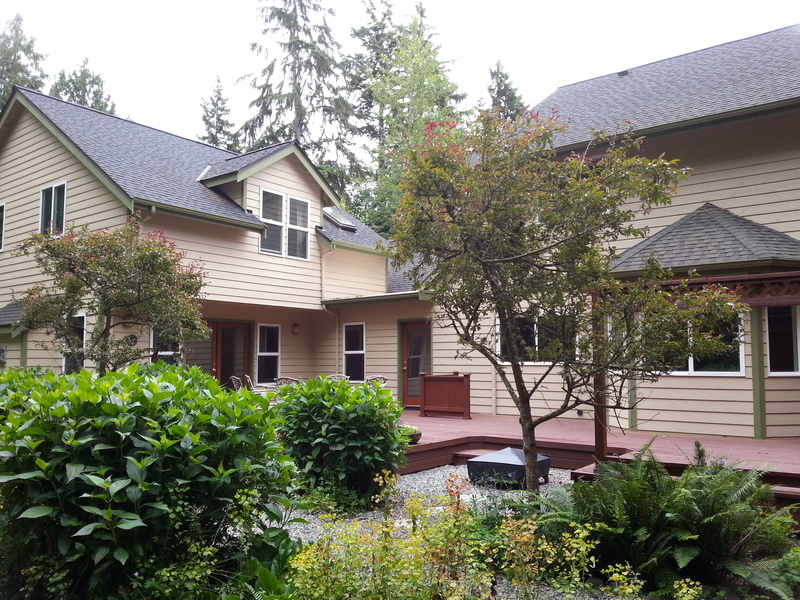 Last Wednesday, I moved house and two days ago the sale of our beautiful house was completed. 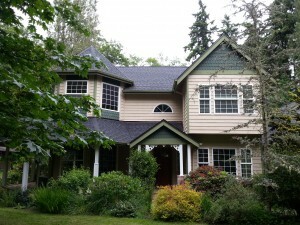 Now I’m getting settled at my new house, I’m planning on being more diligent about blog writing! 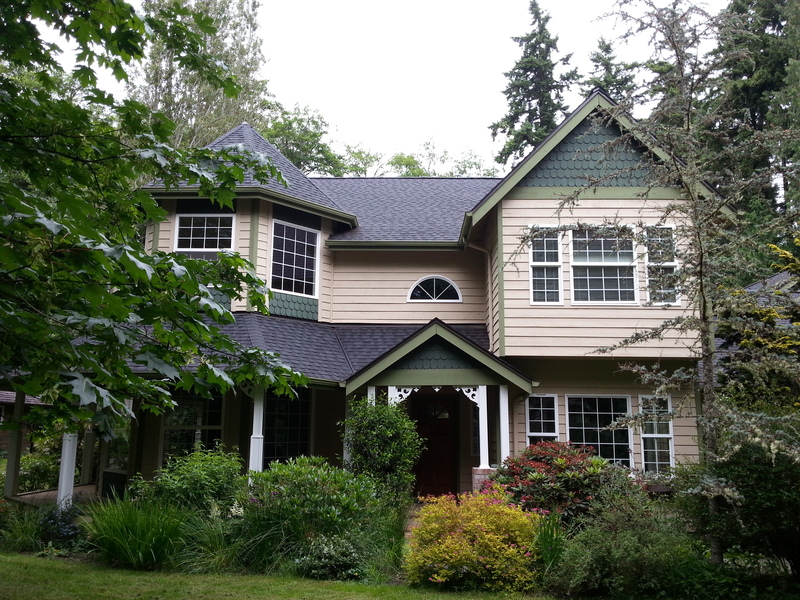 We moved into this house in September 2000 and had many happy times here. It was a wonderful place to entertain and the rooms were light and airy. 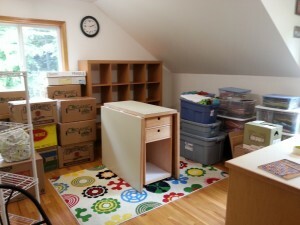 My studio was perfect and I was sad to pack it up and leave. I stowed all my fabric and other goodies in cardboard boxes and plastic bins. 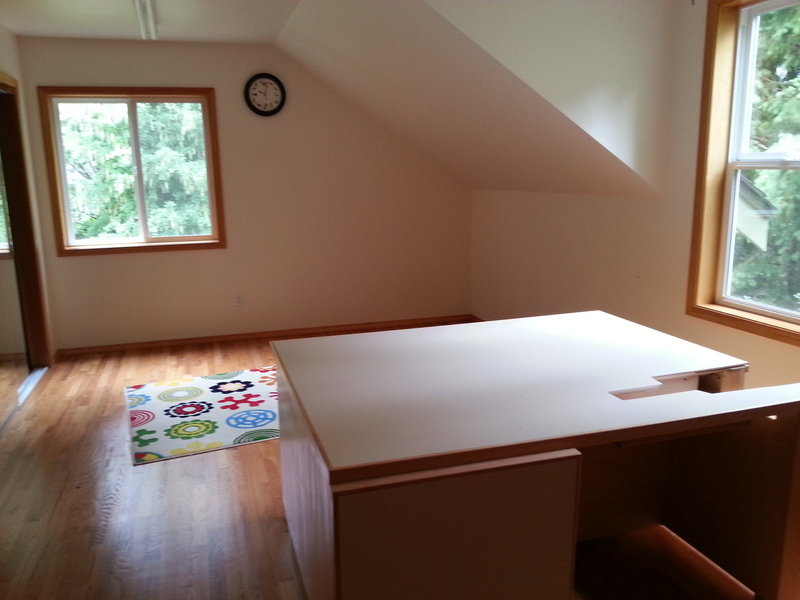 A few days before moving day, Ralph the cabinet maker who crafted my wonderful sewing table, came over and unscrewed the top for transportation. 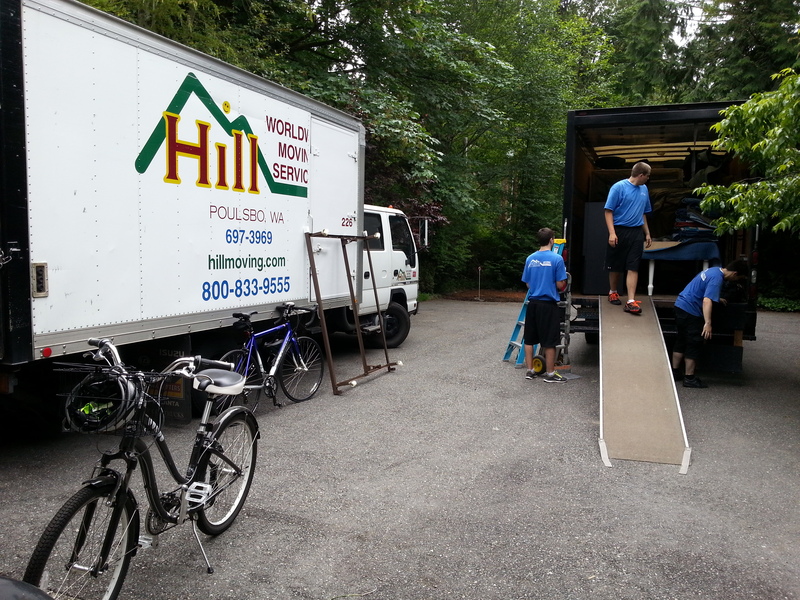 We had a mini crisis during the move when the guys couldn’t get the body of the table through the door. It was about an inch too large. Fortunately, Ralph was at home and came to the rescue immediately. He had to remove the feet and then it went through the door and into the moving truck. He came to my new place the next day and put it all back together. 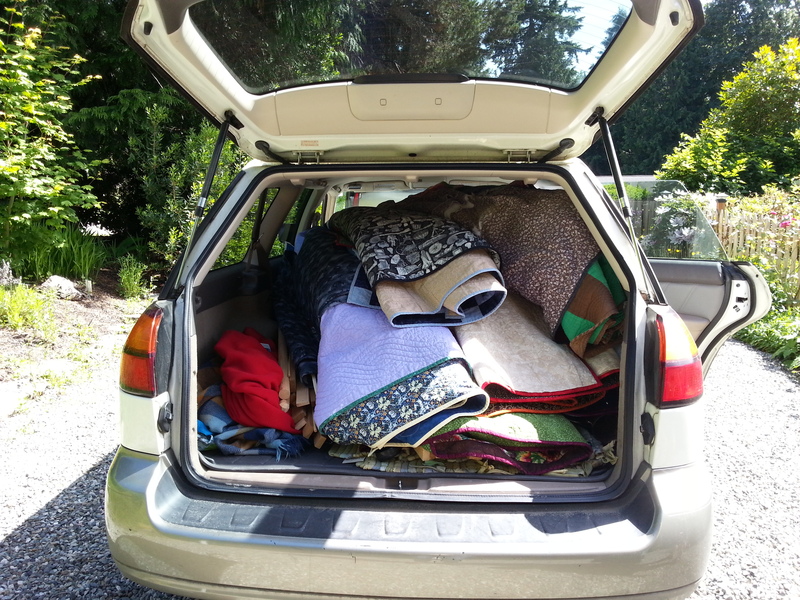 The most precious cargo was all my quilts. 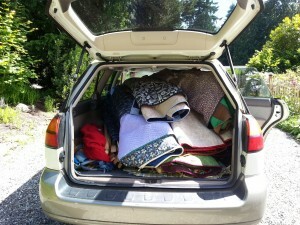 These went in my car to make the four mile journey to my new house on the north end of Bainbridge Island. As you can see, it was quite a load. The good news about all of this is that I love my new place and am making it my own. 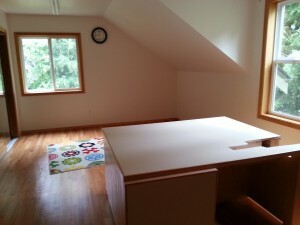 What was in my old studio is spread between three small rooms, but I think it’s going to work out nicely. I’ll give you a tour when I’ve done more unpacking.